Garages tend to become the "default" storage place. How often have you thought, "If it doesn't fit elsewhere, I'll just put it in the garage." This works fine until you have no room left to store your car! Wouldn't you like to use your garage as a garage? Sometimes, it's easier to organize the garage once the rest of the house has been sifted through and sorted out. That way, when you get to the garage, you only have to figure out what you keep and where in the garage to put it. There are no other options! But organizing your garage doesn't have to wait. You can do it anytime and sooner is better than later. 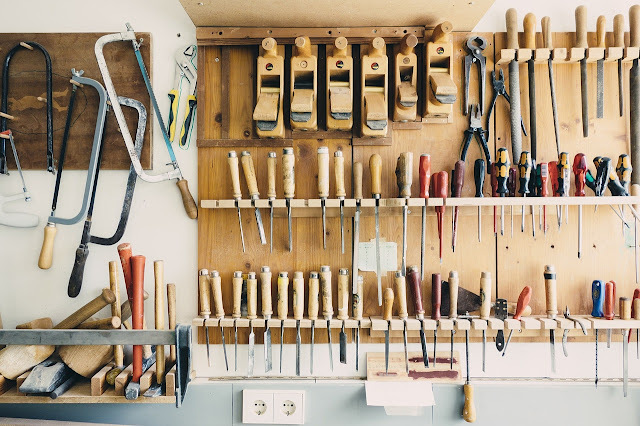 Tools and gardening equipment can be easily and quickly organized using slatwall or pegboard. 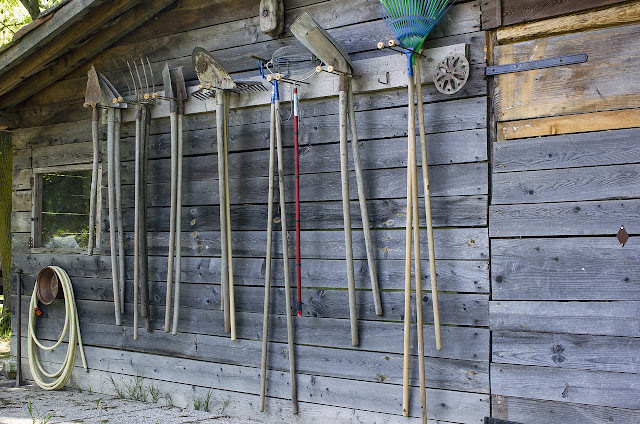 If you have an outdoor shed, that might be a better place than your garage to keep your gardening and yard tools. Decide what really belongs in the garage...first and foremost, your car. It makes no sense to keep such a valuable, expensive possession as your car outside in the elements while miscellaneous stuff in random boxes is stored in its place in the garage. Decide what items will stay in the garage, what items can be moved to a shed, and what will be discarded. Be careful about placing items in a storage shed that is not climate controlled. The items you store there should be able to withstand the climate extremes of your area - hot or cold. Tools and gardening equipment can be easily and quickly organized using slatwall panels or pegboard. Both are wall mounted options and provide adjustable storage by attaching special hooks, brackets, baskets, and even shelves (sold separately). Power tools, carpentry tools, extension cords, and even sports equipment can be stored using slat wall or pegboard. Shelving units and plastic storage containers are invaluable storage aids in the garage. They keep your belongings off the floor and protected from dirt, dust and moisture. Clear storage containers make it easier for you to see what's inside, but it is recommended you label everything anyway. We have multiple sets of older versions of these shelves and plastic storage containers and love them! So easy to put together, take apart, move, store, etc. Create storage "zones" in your garage. You may want to have an area dedicated to seasonal storage, another for lawn & garden, one for paint, one for sports equipment, etc. Sometimes the best place to find storage space, especially in a garage, is above your head. If you have high ceilings in your garage, install ceiling storage for plenty of long-term storage space. Odd shaped or fragile sports equipment such as skis, bicycles, fishing poles and golf clubs can find safe out-of-the-way storage with special racks and holders. When you're finished, you should have a neat, clean, and organized garage - with your car parked inside it. And just in case you still have a lot of stuff stored in the garage, you may want to get some parking guides to keep you from pulling into your garage too far.